Attacking a defender, explode with three steps out of triple threat or a live dribble, beat him with your outside foot on the first step, protect with the inside hand, dribble and explode 2-3 back to squared up. 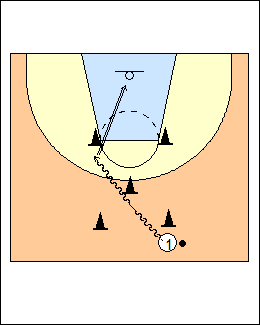 Go five times on each side to the rim, repeat with jump shots (shown). 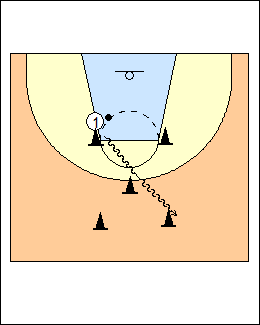 Start on the left from triple-threat, attack R-L-R with one dribble back to square, don't pick up the dribble, touch the middle cone with the inside (left) hand, attack R-L-R out of a live dribble and shoot, six steps total (or go to the rim). Shooting footwork off the dribble or a catch is inside foot, outside foot. Push-up to explode - do a push-up with both hands on a ball, explode up, beat with the outside foot, square up 2-3 into a shot, make 5 going each direction. 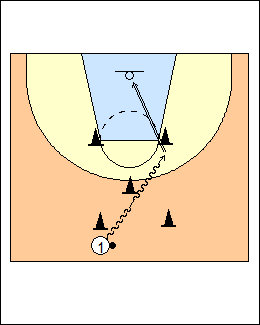 Rebound and attack the other way coming back out, L-R-L from triple threat, touch the cone, L-R-L from a live dribble. Repeat attacking the basket, L-R-L from triple threat, touch the cone, L-R-L from a live dribble, shoot. See Shooting - Steve Alford, Footwork - Ganon Baker jump stop series. Progression - from a live dribble start with a between-the-legs (or crossover) dribble on the first step, two steps back to square, stop and touch the middle cone with a live dribble, go between the legs or crossover, two more steps. 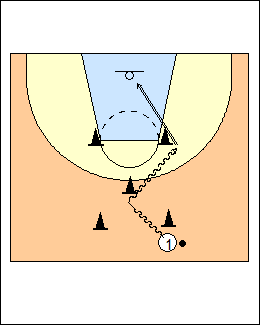 See Dribbling - Altizer moves-counters.